Rethinking what we know about temperatures In the modern world, we are surrounded by assertions relating to temperatures. In particular, we are bombarded by threats and warnings about Global Warming, but whatever the truth or otherwise of these, we need to understand much more clearly what the figures actually mean. The basic physics and commonsense of the matters are quite simple. Unfortunately, though, in the interpretation of these simple things, some real stumbles and misconceptions have somehow been incorporated and perpetuated. Correcting such misconceptions ought to be easy. The basic science involved is not controversial. Two things make correction difficult in the face of established belief. First, it is always difficult to correct a well-entrenched misconception. Second, those foolhardy enough to offer corrections can expect a truly remarkable display of derision and worse from the establishment. Here we'll start at the beginning and work out what concepts such as temperature mean, then progress gradually and logically towards how perfectly good real measurements may be interpreted -- or sometimes mis-interpreted. What Temperature means Temperature is actually a bit of a slippery concept. When we talk about the mass of something, we can measure and define that mass very exactly, and unless something happens we can expect that mass to stay the same. Temperatures are a bit different. They are the result of a shifting equilibrium, a balance between incoming and outgoing energies, and only stay at the same values as long as the equilibrium is maintained. "In a practical situation and room-temperature setting, humans lose considerable energy due to thermal radiation. However, the energy lost by emitting infrared heat is partially regained by absorbing the heat of surrounding objects (the remainder resulting from generated heat through metabolism). Human skin has an emissivity of very close to 1.0. Using the formulas below then shows a human being, roughly 2 square meters in area, and about 307 kelvins in temperature, continuously radiates about 1000 watts. However, if people are indoors, surrounded by surfaces at 296 K, they receive back about 900 watts from the wall, ceiling, and other surroundings, so the net loss is only about 100 watts. These heat transfer estimates are highly dependent on extrinsic variables, such as wearing clothes". Defining 'Temperature' The Macquarie Dictionary has a long definition which starts "Measure of the degree of hotness or coldness of a body which determines the rate at which heat will be transferred to or from it". Basically, the temperature tells you how much heat energy a thing contains at the instant of observation. Everyday temperatures are measured in degrees Celsius, a scale where the freezing point of water is set at 0 deg C and its boiling point at 100 deg C. Room temperatures are around 20 deg C, so a thermometer marked with 100 divisions between its readings for freezing and boiling water would show a reading of around 20 in an average room. Scientists working with heat calculations may use the Kelvin scale. The degrees in this scale are the same size as the Celsius ones, but the lowest value on this scale is set to Absolute Zero, the temperature at which the body contains no heat at all (and hence cannot be further cooled). Absolute Zero is at minus 273.15 deg C, or 0 K, so the temperatures of 307 K and 296 K mentioned above convert to 34 deg C and 23 deg C when 273 is subtracted from them. The Kelvin scale is useful for calculations because it does reflect the actual heat content of something, so that a body at 500 K has twice the heat energy of a similar body at 250 K. This isn't true of the Celsius scale, in that something at 50 deg C is not twice as hot as one at 25 deg C.
How the heat energy is held How heat is held in a body varies according to whether it is a solid, a liquid, a gas, or some other state. In a crystalline solid of a simple substance, virtually all the heat content is in the form of vibrational energy, where the bonds between the constituent atoms shorten and lengthen at a rapid rate. The model represents the solid as a 3-dimensional latticework of atoms, and the heat energy as vibrations of the links between atoms. In a liquid, heat energy is held in the rapid movement of its constituent atoms and molecules, as well as in vibrations of chemical bonds and perhaps other weaker attractions in and between molecules. Even a low-powered microscope will readily show 'Brownian Motion' in liquids, where movements of the liquid's molecules buffet larger particles around. In a gas, the attractions between the 'loose' molecules or atoms are insignificant. Instead, most of the heat energy of the gas (and this may be a mixture of gases) is held in the kinetic energy of its components as they move about and collide with each other, and with the walls of a container, at high speeds. Each molecule may contain further energy in its bonds. 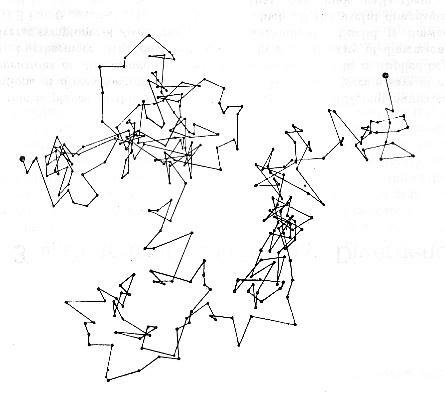 In the standard model, gases are treated as tiny balls flying around randomly and colliding with each other and with the walls of any container. The 'pressure' of the gas comes from these collisions against the walls of the container. The hotter the gas, the faster the tiny balls fly around. It's only by convention that we call all these types of energy 'heat'. For example, in the movement of gas molecules, the heat is in the kinetic energy of all the molecules. A cricket ball flying through the air will also have kinetic energy, but this isn't thought of as its heat. The energy of a system is 'conserved', that is, it can change its form (as when a heated metal saucepan transfers energy to boil the water it contains), but the total of energy is unchanged. As well as the heat contained at various temperatures by solids, liquids, and gases, there may be considerable energy needed to change a substance between these states. As an example, to change 1 kg of ice at 0 deg C to 1 kg of water at 0 deg C, it has to take in 334 kilojoules of energy . To raise the kilogram of water one degree C takes a little over 4 kilojoules (4.187). In other words, it takes as much energy to melt ice as it does to heat the melted ice up to 80 deg C.
Changing boiling water at 100 deg C to water vapour at the same temperature takes even more energy -- 2270 kilojoules per kilogram. When we are looking at weather and climate processes, these 'hidden' stores of energy can be very significant. Later on, we'll look at the relative sizes of these factors in the big picture. How heat travels The three main ways in which heat travels are Conduction, Convection, and Radiation. Conduction happens mostly in solids which are in physical contact, and takes place when the vibrational energy in one solid is partly transferred to another solid in contact with the first. The molecules involved keep their places relative to one another. Transfer of heat by conduction is quite slow. It only happens at the junction of a hotter body with a cooler one, so transfer only occurs across a single surface. Heat transfer rates in rocks might be measured in centimetres per hour. Convection happens in fluids (liquids and gases) where molecules or aggregates move relative to one another, under the influence of gravity. When a saucepan of stew is heated over a gas burner, liquid at the bottom of the saucepan heats up and expands, becoming less dense and rising toward the top. The movement mixes the stew. If some stew in a ceramic bowl is placed in a microwave oven and energy added (as microwave radiation), this heat is added more evenly throughout the stew, and much less mixing occurs. Transfer of heat by convection happens only in gases and liquids, since it involves physical displacement of parts of the fluid relative to one another. As tropical lands are heated by the Sun, the heated air rises and is circulated in the atmosphere. Heat transfer rates in winds might be given in kilometres per hour. In radiational transfer of heat, energy is transformed into electromagnetic radiation (light, infrared, microwave etc), which can move from one place to another without involving molecules or other forms of matter. Movement is extremely fast (at the speed of light) and can happen in a vacuum, as when heat and light from the Sun travels through space to reach the Earth. The Earth as a globe in space Recent years have given us some stunning pictures of the Earth as viewed from space. Almost three-quarters of the surface is covered by the oceans and other water. Above these oceans, and the land surface, is the atmosphere -- dense at sea-level, thinning with increasing elevation to maybe 40 km above sealevel, and negligible above 100 km. And always there are clouds, most of which are in the lowest 10 km. The 'Average Global Temperature' All the current concerns about weather and climate focus on 'man-made global warming'. It is claimed that the 'average temperature' of the Earth has increased over the preceding 10, 50, or 150 years, by 0.5, 0.8, or some other number of degrees C.
Because the amount of carbon dioxide in the atmosphere has undeniably increased over these periods (attributed to increasing use of fossil fuels and clearing of forests), this increase in 'greenhouse gases' has been blamed for temperature rises. The widely-promoted fear is that there will be a 'runaway greenhouse effect', where world temperatures will increase out of control, and damage the Earth for habitation. This ongoing controversy is not dealt with here. Instead, we will look at some of the background to the whole business, and the assumptions usually made. "I just made it up!" How is the average global temperature of the Earth calculated? On the face of it, this seems a simple matter, just make regular readings at representative places and average these out. But delve into how this is done, or could be done, and you find you have disappeared down an 'Alice in Wonderland' rabbithole. Quotation TMQ3. "I just made it up!" "How do they calculate the average temperature to say that the earth's temperature is a particular number (I can't believe they just do an arithmetic average of 10,000 readings around the world.)? " On these question pages, readers give their own responses as to where good answers to the questions may be found, and all the responses received are rated according to what proportion of readers who recommended them. How did the responses to this question work out? In the event, only two reader responses were received. Both recommended the same site , so this received a rating of 100%. This sounds hopeful. But look at the site  yourself, and you'll find that though it is a soundly based scientific analysis, it is really only a student exercise on calculating how much energy the Earth receives from the Sun. Look at the first few hundred of the more than one million Google references, and you will find that none of them actually tell you how 'average global temperatures' are worked out. 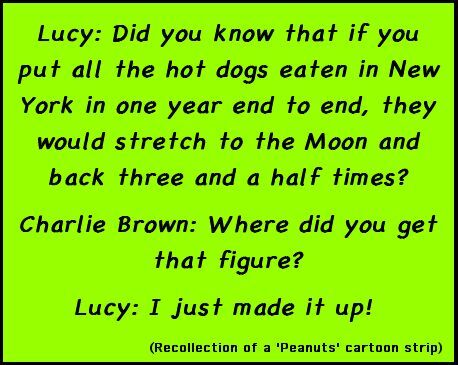 The whole apparatus is a vast sham - Lucy could do as well, and much more quickly. So here is the first surprise. All the rhetoric and threats about the dangers of global warming, about the temperature of the Earth increasing, is dependent upon obscure estimates from unidentified and unreliable sources. Surprise TMS1. Dodgy temperature figures. The first reaction to this statement might be one of disbelief. After all, detailed temperature recordings have been made at many places on Earth for well over a hundred years, and secondary assessments from such things as Antarctic ice cores extend the data back towards a million years ago. Note that the statement does not claim that mean temperatures have not risen at many places on Earth over recent years, only that their averaging to cover the whole of the planet is unreliable. So what's wrong with the whole process? An investigation by three scientists from Danish and Canadian universities  claims that measuring an average global temperature cannot be done. They say that "the concept is thermodynamically, as well as mathematically, an impossibility". 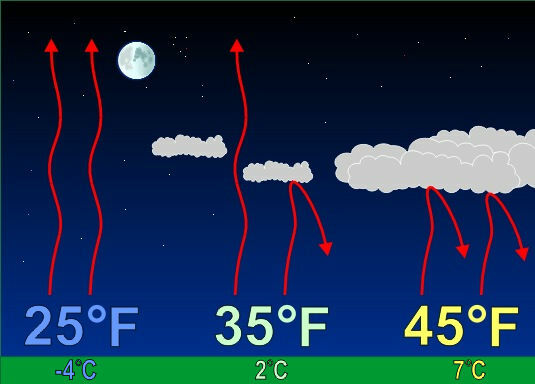 Looking at the atmosphere Our main perception of the temperatures around us comes from the weather, and weather events occur mostly in the atmosphere. The atmosphere is a layer of gases, mostly nitrogen and oxygen, with a little argon and water vapour plus traces of carbon dioxide, extending upwards from the land and sea surfaces. It gets thinner with height. Air temperatures generally get lower as you go higher, for example in climbing a mountain. But above about 10 km, the height at which many jet planes cruise, the situation looks more complicated. The fall in temperature as you go higher, from sealevel up to about 10 km above sealevel (for comparison, Mount Everest is just under 9 km high), is in accordance with normal gas laws. Gases cool as they expand, as you might notice when you release them from an aerosol spray. So what's happening at greater heights, with the graph showing temperatures dropping to -100 deg C and rising to as much as 1500 deg C? The short answer (not one you will find in most textbooks) is that our standard model of what 'temperature' means in gases, that depicted in Fig. TMF3, begins to break down as the gas molecules get more and more sparse and less likely to collide with one another. The average speed at which the molecules move around no longer reflects what we think of as their temperature. For example, if you accepted the temperatures in the upper part of Fig. TMF5 as being 'real', you might think that a satellite or spaceship at a height of 500 km might be in danger of burning up or melting at the temperatures of 500-1500 deg shown. Suppose you were orbiting the Earth at a height of 500 km, and you reeled out an ordinary glass/mercury thermometer on a piece of string, what temperature would it show? Assuming that the thermometer was far enough away from you and the spaceship not to be influenced by the heat you were emitting, and the thermometer tumbled enough to equalize its temperature over all its parts, the answer would be something like minus 15 degrees Centigrade. In this situation, the thermometer would be approaching the situation of a sphere in space at the distance of the Earth from the Sun. If effectively in isolation, the sphere's temperature would always be in dynamic equilibrium -- at any instant the incoming heat energy would equal the outgoing heat energy. Of course this applies to the average for the sphere as a whole. Parts of it might well be hotter or cooler than others, parts of it might well be radiating heat at bigger or smaller rates than others. Where and how temperatures are measured If detailed records of temperatures have been made for many years and in many locations on Earth, what's the difficulty in averaging them out to get a reliable figure? There are many problems. The first problem concerns where the sampling points are located. The huge majority of temperature readings are taken at places where people are living. This is only a tiny fraction of the total surface. Almost three-quarters of the Earth's surface is covered by oceans and other waters, none of this has been the subject of regular daily temperature sampling. Vast areas of ice, in Antarctica and Greenland, are similarly neglected. In mountainous areas, most readings will be from sheltered valleys, all the slopes and summits will be ignored. Great deserts and jungles will have few recording stations. So while records for given recording stations may be accurate enough, they represent only a tiny percentage of the Earth's surface, and averaging them out for the whole planet is hopelessly inadequate. A second problem concerns how individual readings for the same station are averaged. 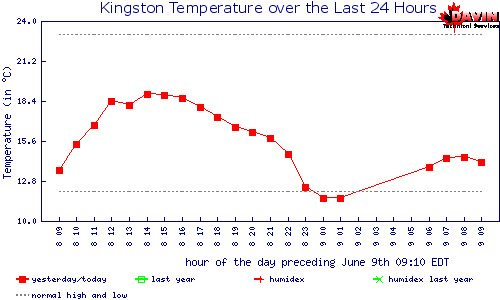 The figure shows how temperature varied during one day at a Canadian weather station. It can be seen that on June 8-9 the temperature had a high around 19 deg C and a low around 12 deg C, a difference of 7 deg C. (Normal figures are noted as about 11 to 23 deg C, 12 deg C difference in a day). If the 'average' temperature was taken as halfway between the maximum and the minimum, this would work out at 15.5 deg C. However, because the time spent near the minimum was much shorter than the time spent near the maximum, the 'true' average for this day works out closer to 16 deg C, half a degree different. This temperature chart was chosen at random. Other parts of the world, particularly sunny inland areas such as the Western Australian deserts, would show show much greater daily variations, at least 20 deg C and sometimes as much as 50 deg C, and very possibly 'true' averages would be one degree or more different from the halfway point between maximum and minimum. Now it might be commented that such discrepancies, of half or one degree, are only minor. But these differences, resulting purely from various methods of calculation, are in fact comparable to those quoted as threatening the world through Global Warming. A third problem concerns the surroundings and environment of the recording stations. Since many stations are located in urban areas, building developments can lead to 'urban heat islands', where the 'normal' daily temperature ranges are distorted. For example, a nine-year study of temperatures in London and in the surrounding countryside found that "Night is 3.70 deg C warmer and day 0.34 deg C cooler in the city than in the country" . In this instance, the 'average' temperature in the built-up area was altered by over 2 deg C.
The presence of vegetation can also affect temperature readings, both at recording sites and further afield -- the reference just quoted noted that urban heat islands could affect growing conditions up to 10 km beyond the urban sprawl. Local treatments can have a dramatic effect on temperatures recorded. The above figure shows how a planting of sweet potatoes on a Japanese rooftop was able to reduce peak daytime temperatures by as much as 27 deg C. Urban development is often accompanied by reduction in local vegetation, which could clearly affect temperature readings. Nothing in what's presented here necessarily proves that 'global warming' as commonly perceived does or does not occur, it only points up the unreliability of commonly-quoted data. Is there a more reliable approach available? Measuring temperatures from Space Near-Earth satellites in orbits which pass over the Poles can make temperature measurements which avoid most of the 'local' problems noted for conventional recording stations. The readings will be more generalised, and figures will relate to somewhat higher altitudes than the ground readings, but generalized trends should be readily available. Many such measurements have now been made, over periods of more than 10 years, and some have been analysed by Roy Spencer of NASA . 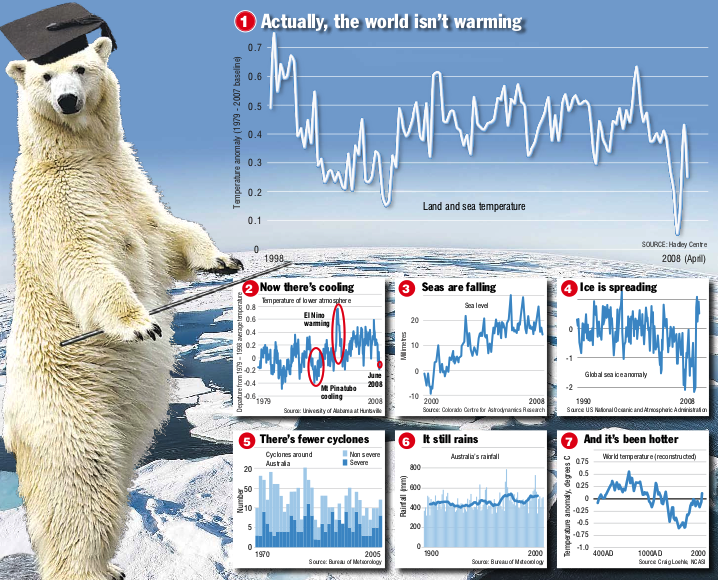 His satellite trends show cooling of 0.04 deg C to 0.01 deg C per decade. Weather balloon trends have indicated coolings of 0.07 deg C to 0.02 deg C per decade. These figures do not really tell us much, except that any temperature trends are very small. Land-based recording stations do, of course, make their records at their individual heights above sea level. Another way of looking at the satellite figures would be to say that at heights of 10 km above sea level, average temperatures show no appreciable trend up or down. The Earth's energy inputs and outputs In the Earth's temperature balance, the major energy input is the radiation received from the Sun. Hold up a one-square-metre panel in space, at Earth's distance and at right angles to the Sun's rays, and it will receive energy at a little over 1300 Watts, enough to run a small air-conditioner. It's important to remember that a panel like this would rapidly settle down into equilibrium, and at equilibrium, energy received would exactly equal energy lost -- that is what equilibrium means. Of course, the wavelengths of the incoming and outgoing radiation would be different, most of the energy received would be in the visible light range, comparatively short wavelengths. Any object in space at any temperature above absolute zero, -273 deg C, continuously radiates energy away, with hotter parts radiating at shorter wavelengths. For a panel at Earth's distance from the Sun, with an average temperature of around minus 15 deg C, the radiation would be mostly in longer-wavelength infrared, typical of a radiant heat source like a home radiator. If the panel was on a communications satellite and included photo-voltaic cells which turned some of the Sun's radiation into electricity, then some of the 'outgoing' energy would be contained in the radio waves carrying TV signals and such to Earth. Larger satellites, like the Space Station, may also hold 'latent' energy in the form of fuels. Empty space does not allow heat transfer by conduction or convection, only by radiation (not counting physical transfers by spaceships). If we now look at the entire Earth, as a globe in space, this too receives the overwhelming part of its incoming energy from the Sun. Only a part of the sunlight reaches the surface -- some 37% is immediately reflected off into space, more is absorbed in the Earth's atmosphere, and only the sector in the tropics where the Sun is immediately overhead receives a full dose. The solar flux, the average amount of energy from the Sun reaching the Earth's surface, is estimated at about 100 Watts per square metre (enough to run a largish light bulb) . There is also some energy, the geothermal flux, which comes up from within the Earth, due to internal processes not related to sunlight. Although much smaller, at around 0.075 Watts per square metre, this energy is very steady and has been continuing since remote geological times. Temperatures rise about 25 deg C for each kilometre you go down in the Earth, and the average temperature at 1 km down will be around 40 deg C. The Earth also has stores of fossil and radioactive-atom fuels, and use of these will add a little to energy input. Now for the important part There is a fundamental point here which most examinations of climate change just gloss over. 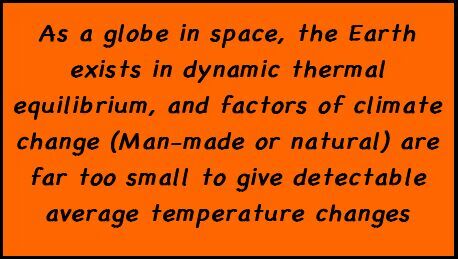 As a globe in space, at any instant the Earth is in dynamic thermal equilibrium -- heat energy lost through radiation exactly balances incoming energy (mostly from the Sun, but with a little from within the Earth and from stored fuels). If the Sun is a little more active, or we use more fossil fuels, measured temperatures around the Earth will increase a tiny amount, and energy radiated off will also increase slightly to maintain the balance. In this 'self-balancing' situation, energy usage by the human race is such a tiny part of the total energy involved that it could not have any significant effect on average global temperatures. This applies whether 'man-made global warming' exists or not. Whether man's activities are putting heat into the atmosphere, or whether climate changes are purely natural, either case cannot appreciably affect average temperatures on the Earth. Surprise TMS2. The Earth's temperature is indifferent to Man's heat inputs. Such a statement needs much supporting factual information to be acceptable. A lot of this information is in a companion article, Will Greenzilla Destroy the Earth? . Here is a list of some relevant factors, most of which can be followed up from this reference. Factor 1. 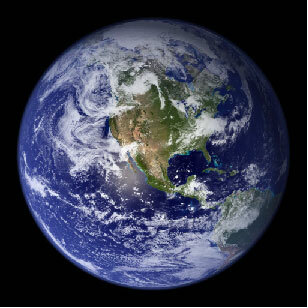 The total heat capacity of the Earth's atmosphere is equivalent to that of a layer of water only 2.5 metres deep. Factor 2. The total heat capacity of all the carbon dioxide in the Earth's atmosphere is equivalent to that of a layer of water less than 1 millimetre deep. Factor 3. Every year, the Earth receives much more than 10,000 times as much energy from the Sun as Mankind uses. Factor 4. The average depth of the oceans and seas is about 3.5 kilometres, and the heat capacity of this water is 1000 times that of the atmosphere. Factor 5. Each year, the Gulf Stream transports north around 100 times as much energy as Mankind uses. Factor 6. Places in western Europe influenced by the Gulf Stream have average temperatures up to 6 deg C higher than inland places at comparable latitudes without this influence. Factor 7. Weather and climate events occurring in the atmosphere (especially winds) have action periods of a few days to weeks only. Factor 8. Weather and climate events occurring in the seas and oceans (especially ocean currents) have action periods of months to years. If these factors are considered, it is pretty obvious that Man's use of energy is far too small to influence the planet as a whole. But what about natural variations in incoming energy, they must surely re-set the thermal equilibrium levels, could they possibly cause significant buildups or drops in the Earth's heat stores? Variations in incoming energy The energy received from the Sun is not completely constant, but varies both with changes within the Sun itself, and with longer and shorter cycles involving variations in orbits. These cycles, varying from as little as 11 years (sunspot cycles) to as much as 250 million years (the solar system orbiting the galactic centre) are mentioned in Greenzilla. There are shorter cycles we are all familiar with. During the course of a year, the Earth makes one orbit of the Sun. This orbit is not a perfect circle, but an ellipse, and the Sun is not at the centre of the ellipse, but at one of the two focus points. "At present the perihelion occurs around 3 January, while the aphelion is around 5 July. The difference in distance of Earth from the sun at these times affects the amount of solar radiation reaching the atmosphere. At perihelion a maximum of 1400 W/m2 is received, while at aphelion the value is 1311 W/m2, thus varying by about 7 per cent between perihelion and aphelion". There may be an instinctive feeling that the Earth could hold on to the greater heat received during the close-to-Sun periods, rather than lose it almost immediately because of the dynamic thermal balance situation. But this idea does not correspond to reality. For example, if the Earth's temperature varied by 7 percent on the absolute scale (the scale that actually reflects heat content), this would correspond to a variation of over 17 deg C in the different parts of the yearly orbit. In fact, we do feel some effects from the elliptical orbit -- because the closest approach (perihelion) happens early in January, in the northern-hemisphere winter and the southern summer, summers in Australia are hotter (and shorter) than those for comparable areas in Europe. But if heat was actually being held on to from perihelion, winters in Europe would also be hotter than those of comparable southern-hemisphere lands, and this is not seen to happen. It appears that because the Earth's atmosphere has only very small heat capacity, it cannot smooth out the seasonal changes due to Earth's elliptical orbit. The oceans do have the heat capacity to reflect climate change, but respond too slowly to register changes over short periods of months or less. There is an even greater variation in energy -- the change from day to night, as the Earth rotates and turns its surface away from the Sun. The variation is almost 100 percent -- the night side receives virtually no sunlight, and the dynamic thermal balance drops temperatures rapidly. The Plastic Mac Effect It's shown in Greenzilla that the so-called 'Greenhouse Effect' has no correspondence with reality in the sense of acting like a real greenhouse, with an impermeable roof preventing warm air rising above it. What's a better picture of the climate/weather situation? If you look again at Fig. TMF5, you can see how the atmosphere can be divided up into layers according to height above sealevel. 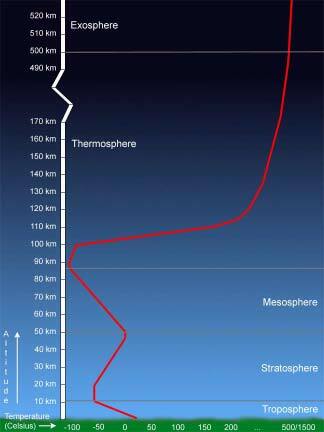 It is in the lowest 10-kilometre layer, called the Troposphere, where the vast majority of effects we class as 'weather' and 'climate' occur. The Troposphere contains about 80 percent of the atmosphere's mass, and hence most of its heat capacity. Briefly, 'weather' is what we experience over shorter periods, maybe weeks or months, and involves winds and movement of tropospheric entities like high-pressure areas, cold fronts, and clouds. 'Climate' is longer-term trends, years to centuries, and includes not only persistent weather effects, but also other effects such as ocean currents and changes in solar radiation. The atmosphere does act as one of the insulating layers of the Earth. The centre of the Earth is thought to be at a temperature of about 3000 deg C, successively higher layers are at lower temperatures, until at 1-2 km below the surface, temperatures are usually around 40-60 deg C. At the surface itself, the average temperature (the one most people are concerned with) is about 15 deg C, though a high of 58 deg C and a low of -89 deg C (in open conditions) have been recorded . Above the surface, in the insulating layer of the atmosphere, 'true' temperatures gradually reduce going higher in the Troposphere, down to about -50 deg C. This fall-off in temperature is partly due to the physics of gases (as air rises, it expands, causing cooling), but is also due to loss of heat through radiation, conduction, and convection. The atmosphere does not 'trap' heat, as is implied in the term 'Greenhouse Effect' (in a real greenhouse, a roof prevents upward movement of warm air). Instead, the atmosphere slows down loss of heat to space, mostly from conduction and convection. On the Moon, which has no atmosphere and so lacks these mechanisms for slowing heat loss to space, temperature changes at the surface are much more marked than on Earth. Typical daytime temperatures are around 120 deg C, nighttime ones about -150 deg C. The half-way point is at -15 deg C, as would be expected for a globe in Earth's orbit. The Moon's heat loss is all through radiation (infrared waves, travelling at the speed of light). So instead of a 'Greenhouse Effect', a closer term for Earth's situation might be the 'Overcoat Effect', or, since the blanket is fairly transparent, the 'Plastic Mac Effect'. Heat movement by radiation is active at all times, but movement by conduction and convection may be slowed. The closest that things come to a physical greenhouse is when the sky is completely overcast with clouds. Although not a solid roof, the clouds do inhibit upward movement of heat by convection, and because of this, wind movements are small. The outcome is that while cloud overcast is maintained, day and night temperatures remain very similar, possibly varying by less than one degree C.
We have now arrived at a good general picture of what's happening with heat energy and the Earth. A huge amount of energy arrives each day from the Sun, a tiny amount is generated from within the planet or by using energy stores. Exactly the same total amount of energy is lost through radiation from all parts of the surface open or partly open to space. This radiation includes direct reflection of light by clouds, glaciers, and icecaps during the day. It includes radiation of heat (infrared) from all parts of the land surface, from surfaces and shallow depths of oceans, seas, and lakes. It includes infrared radiation from all gas molecules and clouds of the entire atmosphere. This heat radiation takes place 24 hours a day, everywhere, at a greater rate and shorter wavelengths from warmer surfaces, and a smaller rate and longer wavelengths from cooler parts. There are also some very tiny further energy losses, such as radio and TV broadcasts lost to space, but these are neglible in the overall picture. Because the Earth is a globe in space, where conduction and convection cannot apply, all this energy exchange is via radiation. It is because the outgoing radiation is emitted from all parts of the atmosphere, as well as land and water surfaces, that relying on temperature readings from a number of places on the land surface cannot give a meaningful value for an 'average global temperature'. Temperatures of the Moon and Venus Is the temperature of a globe in space, at the distance of the Earth from the Sun, affected by its size? For example, what are the relative amounts of sunlight received by the Earth and the Moon? The diameter of the Earth is about 3.7 times that of the Moon, so the relative sizes of the discs they present to the Sun is the square of this, about 13.7. The impact of sunlight is proportional to the disc size, so the Earth receives about 13.7 times as much energy from sunlight as the Moon. However, the Earth has about 81 times the mass of the Moon, which means that the Moon receives almost 6 times as much sunlight per tonne of its mass as the Earth. Is there anything to suggest this makes the Moon hotter than the Earth? Of course, the answer is No. Both the Earth and the Moon are globes in space, in dynamic thermal equilibrium, at the same average distance from the Sun. They will therefore have similar 'average' temperatures. There are numerous complications which could be gone into. The Moon is, on average, about 385,000 km from Earth. When the Moon is new, it is this amount closer to the Sun than the Earth; when full, this amount further away. So if anyone cared to measure it, the average surface temperature of the new Moon should be about 1 percent, or 3 deg C, warmer than that of the full moon. Turning now to Venus, the very high surface temperatures detected for this planet, and the fact that its atmosphere is mostly carbon dioxide, have led some to the assertion that Venus is the subject of a 'Runaway Greenhouse Effect'. We shall see that this assertion is totally false and misleading. Although Venus is only a little smaller than Earth, its atmosphere and rotation time, and the fact that it is a good deal closer to the Sun than we are, make conditions there very different. The most important difference is that Venus has an immensely thick atmosphere, over 90 times as much as Earth, and this is almost all (97%) carbon dioxide, with no water. It is perpetually shrouded by thick clouds, which immediately reflect off two-thirds of the sunlight falling on it . Venus rotates on its axis very slowly compared to Earth, taking 243 days, which is longer than it takes to circle the Sun (225 days). Temperatures at its surface are very high, about 462 deg C, higher than the average for Mercury, the closest planet to the Sun. It is this high value which has led to the suggestion that Venus is subject to a 'Runaway Greenhouse Effect' caused by all the carbon dioxide in its atmosphere. An important point about surface temperatures on Venus is that they are almost constant -- hardly varying from pole to equator, from sunlit to dark side. This is one of the points which are important in showing that the 'Runaway Greenhouse' idea is mistaken. Let's look in a bit more detail at conditions in the Venus atmosphere. From the figure it can be seen that on Venus, as on Earth, temperatures get lower as you rise, at least in the lower sections. In comparing this figure with TMF5, that for Earth, note that on the Venus diagram, temperatures are in degrees Kelvin -- subtract 273 to get degrees Celsius. So the way the temperature falls, from the +462 deg C at the surface down to about -120 deg C at a height of around 90 km, is actually not that different to Earth. Above 100 km, the atmosphere begins to thin out to the extent that the standard interpretation of 'temperature' based on movement of gas molecules begins to lose meaning. 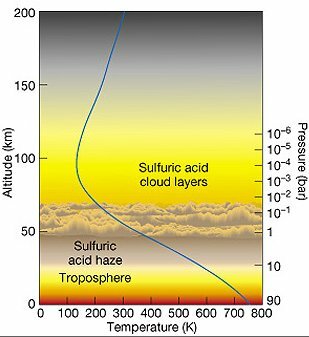 In the very dense cloud layer, at a height of 50 to 70 km, temperatures vary from about -50 to +100 deg C. It is this layer which is mainly responsible for the heat energy which Venus radiates away into space. Below the cloud layer is the bulk of the atmosphere, forming an 'overcoat' or 'plastic mac' more than 90 times as dense as Earth's. So the reason why temperatures measured on the surface of Venus appear so high is merely because the insulating effect of this thick atmosphere is so high. If temperatures on Earth were all measured at the bottom of 2 km deep boreholes, their average would be 40-50 deg C higher than the 'surface' ones, because of the insulating effect of the rock. This is a simplification, but the main principles hold. The reason why 'surface' temperatures on Venus are so constant is that the super-dense clouds act as does cloud overcast on Earth, suppressing convective movement -- winds at the surface reach only a few km per hour . 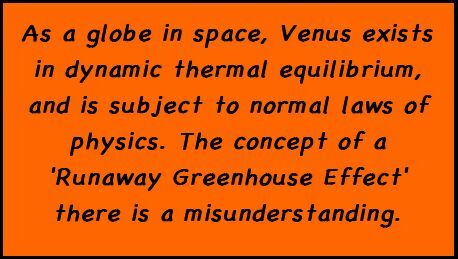 Venus too is a sphere in space, at thermal equilibrium with incoming and outgoing radiative energy, and the 'Runaway Greenhouse Effect' is a misunderstanding. Surprise TMS3. The concept of a 'Runaway Greenhouse Effect' on Venus is a fallacy. Ice, rain, ocean currents, and a green Greenland Many of the things people see as evidence of 'climate change' may be no more than chance variations which will average out in the long run. Trends which last more than 50 or 100 years, comparable to people's lifetimes, merit closer examination. The retreat of glaciers in historic times is the most obvious. While not all glaciers are retreating -- the Hubbard Glacier in Alaska has been advancing since records started in 1895 , and the Franz Josef Glacier in New Zealand has been advancing since the mid-1980s -- the general trend since about 1840 has been for shrinkage. There is ample evidence  that climatic factors, such as extent of ice cover, move in cycles. The glacier graph looks as if it might represent part of a cycle, with a rise up to about 1750 and maybe a bottoming-out around the year 2000, but in any case the cycle time is longer than the 300 years over which we have had any measurements at all. We know for certain that, within historic times, ice coverage has been even less than at present. There are indirect indicators  of previously 'warm' periods, such as the Romans growing grapes in northern England two thousand years ago, and the Vikings settling Greenland one thousand years ago. And there are direct indicators. Ice cores, drilled through 'permanent' icefields to considerable depths, yield a lot of information to researchers. But what's at the bottom of these drill holes? At a site in southern Greenland, scientists drilled through 2 km of ice. At the bottom, they found the site of a pine forest that once existed there, buzzing with prehistoric insect life . 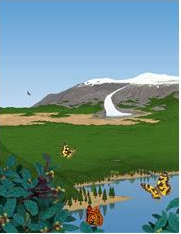 DNA was found from trees such as alder, spruce and pine, along with a mass of insects. Dated to between 450,000 and 800,000 years old, the DNA is among the oldest ever found. It is indisputable that in past eras, Greenland was green enough to merit the name given to it by the Vikings. So changes in the extent of ice are completely natural, one of the three great reservoirs of heat involved in keeping the Earth's temperatures even and amenable. They are the long-term buffer -- active over thousands or tens of thousands of years. Short-term changes over a few centuries or so may well reflect relatively small, slow displacements in the Earth's in/out heat balance equilibrium point, but have nothing to do with Man's activities or atmospheric carbon dioxide content. Perhaps the most dramatic showing of ice changes is in the yearly variation of Arctic sea ice area, in particular its minimum size after the summer warming period, in September. With the benefit of satellite mapping, it has been found that the extent of sea surface ice in September 2007 was less than two-thirds of that in September 1997 . However, the average thickness of sea ice across the entire Arctic Ocean, year round, is only about 2 metres, so this indicator is actually quite sensitive to mid-term variations. And, of course, it is the thinner ice, under a metre in thickness, which will melt first. Also, measurements from icefields may be sometimes only locally relevant. The great ice ages we hear about certainly had major historical impacts in northern Europe and other areas of the northern hemisphere, but less is recorded about southern-hemisphere effects. A fascinating deduction  from an old map is that in 1500 AD, Antarctica's giant Ross and Ronne Ice Shelves were completely melted. And for the mid-term buffer, involving ocean currents, local influences can be all-important. In particular, the Gulf Stream, an immense warm-water current which flows north from the Caribbean towards western Europe, has a major effect on local climates. Its existence was worked out by Benjamin Franklin, from sea temperature measurements made for him by ship captains in the 1700s. Each year, the Gulf Stream carries north about 100 times the total energy used worldwide by Man , and it is this energy which gives Britain and the Atlantic coasts of Europe a far kinder climate than other lands at comparable latitudes. So small changes in the Gulf Stream can have very noticeable effects on local climates. Here is an extract on such effects, from . "The Mini-Ice Age roughly spanned the era from 1200 to 1800, when countries in the Northern Hemisphere experienced exceptionally cold winters. The River Thames often froze, from 1607 to 1814 there were frost fairs, and in the winter of 1780 New York Harbour froze, allowing people to walk from Manhattan to Staten Island. The cause of the cold is not certain, but one likely hypothesis is that it was related to a reduction in flow of the Gulf Stream by up to 10 per cent." Ocean currents are the major mid-range influence on climate and weather because the oceans have a very large heat capacity -- around 1000 times that of the atmosphere -- and they move in slow and deliberate cycles, effective over tens to hundreds of years. The really important short-term buffer for climate and weather also involves water, this time as water vapour, rain and snow. The process known as the hydrological cycle, with evaporation of water from water and land surfaces, involves huge amounts of energy. Here is what one website  has to say. "The energy that drives the hydrologic cycle is energy from the sun -- indeed, this function is the largest single user of the solar energy reaching Earth's surface. The reason so much energy is required is that it takes a great deal of energy to evaporate water -- 2250 joules per gram at the boiling point of 100 degrees C and 2440 joules per gram at Earth's average surface temperature of 15 degrees C. (This is the highest heat of vaporization of any known substance.) It takes fifty times as much energy to evaporate a gram of water as it does to lift it to an altitude of 5 kilometers. The energy used to evaporate the water is stored as latent heat of vaporization, which is released to the environment as heat whenever and wherever the water-vapor condenses into liquid. Thus, energy delivered by the sun at one point on Earth's surface may be released high in the atmosphere over a point 1000 kilometers away. This mechanism of redistributing energy by the transport and condensation of water vapor is a major determinant of Earth's climate." In fact, an average of a quarter of all the Sun's energy falling on the Earth -- and in some cases half that energy -- is used immediately, on the same day, to evaporate water. Notice also that that this energy isn't lost somewhere in the cycle, instead heat is released when the vapour condenses again into rain (and even more is released if this water is turned into snow or ice). This perhaps surprising release of heat during formation of rain is what drives some of the more brutal weather factors, like tornados and major storms. Unlike processes constrained by negative feedback, which use up their energy stores and peter out, tornados and such show positive feedback -- the more energy they use, the more they release, making them powerful, relatively long-lived agents. Another sometimes neglected point is that as water is evaporated, it draws heat from (cools) the surface -- cooling by evaporation is how sweating reduces body temperatures. With the massive energies involved, cooling of several degrees C can occur. Compared to these huge daily temperature changes, any effects due to 'global warming' would be totally swamped. Although this article aims to give background to Earth temperatures, rather than claim they are rising or falling, it has to be said that current evidence doesn't really establish any long-term trends. Surprise TMS4. Man's use of energy is insignificant compared to natural energy cycles. Let's now put some numbers to the picture, to give an idea of the sizes and significance of the forces we are dealing with. Look at the numbers . . . The following table of the energies involved in various weather and climate processes should give a feel for their relative importance. The units are based on the average daily influx of energy from the Sun, which is set at 1 million BL (Big Lump) units. For those interested in the calculations and data sources involved, these have been collected in an Earth Temperatures Calculation Package . In scientific units, 1 BL Unit is equal to 4.28400 x 109 kWh (kilo-Watt-hours) or 1.54224 x 1016 joules. *1 BL Unit is equal to 4.28400 x 109 kWh (kilo-Watt-hours) or 1.54224 x 1016 joules (1.54224 x 1013 kJ). When you look at the table, some of the figures may surprise you. Compared to the 1,000,000 energy units received from the sun each day, Man's activities are totally insignificant. The total of our energy use is only 77 units, of which about 62 units are from fossil fuels. Even the heat which comes up from the Earth, at 213 units, is greater than this. Anything we do is swamped by the natural variation over 6 months as the Earth proceeds in its orbit around the Sun. 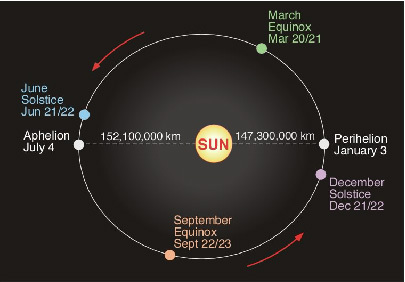 As this orbit is an ellipse, rather than a circle, we get about 70,000 more units on January 3 than we do on July 4. The fact that we don't really notice this just reflects the efficiency of the thermal equilibrium mechanisms, in that more heat coming in just raises temperatures marginally enough to immediately radiate off the extra. Notice also the large amount of energy moved north in the Gulf Stream each day, 7840 units. Since only 22 units are needed to melt 1000 square kilometres of sea ice, 1 metre thick, it is clear that changes in the area of Arctic sea ice are quite sensitive to relatively small variations in movement of the Gulf Stream, and are no special cause for concern. What does it all come down to? It may be humbling to realise the insignificance of Man's activities on the temperature of our planet. The point is, whether these activities -- and in particular production of 'greenhouse gases' -- actually affects temperatures or not, makes no difference at all in the larger physical picture. While physical conditions may be unaffected, social conditions are dramatically pivoted and balanced on current propaganda which can hardly be categorized as other than fraudulent. If it is accepted that man-made global warming is a fallacy, the ongoing repercussions on global and national economies will be profound. Open any newspaper, any time, and the chances are that a lot of it will be about 'carbon footprints', 'saving the planet by reducing fossil fuel use', 'international summits on climate change', and the like. And almost everything there has a negative effect on living costs, with trumpeted 'environmental improvements' often quite illusory. But what to do? Consider the headlines below. Headlines of Type A are the ones we see every day. Perhaps they sell newspapers, and keep people running about in circles, but it is hard to see any benefit from worrying about things which are probably untrue. 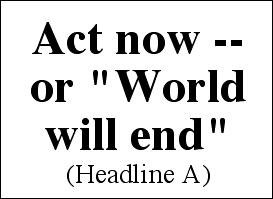 Headlines of Type B are not NEWS!, and so don't actually appear anywhere. If 'Man-made global warming' is actually a fraud, who will benefit from exposing it? When frauds and fallacies come to be exposed, the social damage may be huge. Early in 2002, Americans had to stand back and contemplate the ruins of the huge Enron company, characterized as "the biggest scandal in the history of US capitalism" . More recently, the sentencing of Bernie Madoff to 150 years of prison for fraud has brought no relief to the many thousands who were devasted by his giant Ponzi scheme. But painful as it might be, frauds must be exposed, or the later damage may be even greater. What could be effectively done to expose the Man-Made Global Warming concept to real investigation? 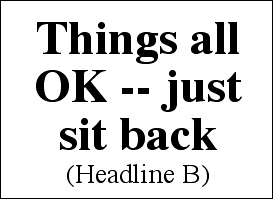 If a Headline Type B is not going to make any stir in the media, perhaps action to invoke Headline Type C might work. 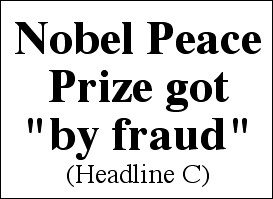 If IPCC, the International Panel on Climate Change, were to be charged with fraudulently obtaining a Nobel Prize, the matter would have to come out into the open and be judged. But maybe no specific action like this is needed. As time passes, the whole man-made climate change wagon is becoming more and more creaky. Soon a couple of its wheels may fall off, and the whole structure will be a wreck stranded in the road. 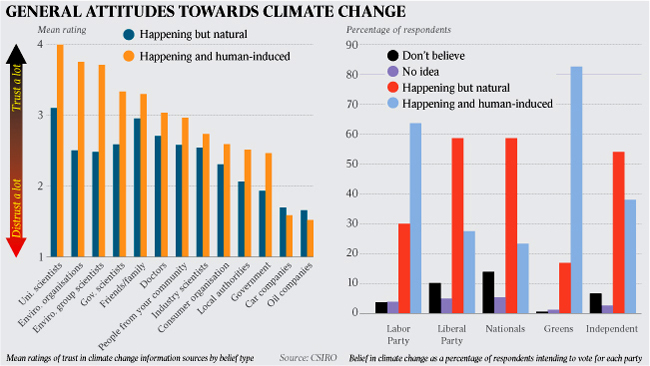 In mid 2012, during the three years since the first version of this article was aired, public scepticism on the matter has greatly increased -- in Australia, it has been reported that 40% no longer believe . 17. Peter Smithson & Kenneth Addison. Fundamentals of the physical environment. Taylor & Francis, 2008. 27. What Caused the Mini-Ice Age?. BBC Focus Magazine, 2009 Apr, p. 50. 30. Ocean: An Illustrated Atlas. National Geographic, 2009. Will Greenzilla Destroy the Earth? Draft Versions, 1.0-1.5, 2009 Apr 29 - 2009 Jun 15. Version 2.0 [Xd], 2012 Jul 1.